I’m not surprised that two of the three young adult finalists fall into the speculative category. I’m pleased, definitely, but not surprised. 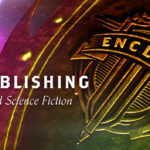 Speculative fiction is all around in our culture as TV programs, movies, games, and books. 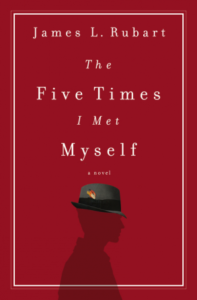 Why shouldn’t Christian novels reflect this same interest? At the end of this month, the Christy Awards, longest running awards for excellence in Christian fiction, will be announced from a group of finalists in nine categories. Recently the award committee announced the finalists. Five speculative novels have been recognized—three in the Visionary category, and two in the Young Adult bracket. 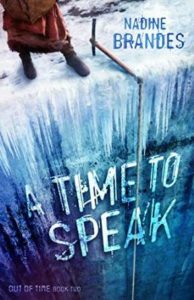 A Time To Speak by Nadine Brandis (published by Enclave Publishing) Book Two in the “Out of Time” series. The rescue wasn’t going at all how he planned. 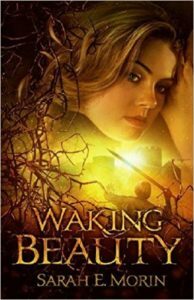 Prince Arpien intends to gain a throne and the sleeping beauty’s heart with a single kiss that wakes her from the evil fairy’s curse. But kissing the princess is only the beginning of a series of unforeseen obstacles: man-eating bugs, deadly spindles, talking lapdogs, and fiery pickles. The sleeping beauty is the biggest complication of all. Princess Brierly is beautiful and Fairy-Gifted, but also…daft. After one hundred years of sleep imprisonment, Brierly refuses to believe this rescue is anything more than a tantalizing but doomed dream. Arpien is drawn to the vibrancy be-neath Brierly’s indifferent exterior. Can they reclaim her kingdom? 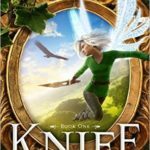 Do they dare trust in the Prince of the old tales to help them battle the evil fairy who cursed Brierly? What is the price of waking beauty? The last time Timothy broke a rule, he got suspended. But when he defies the faery empress, it might well get him killed. 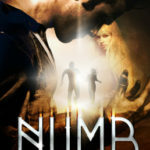 Timothy Sinclair doesn’t believe in faeries—after all the hardships he’s suffered since his missionary parents sent him away to boarding school, he’s not even sure he still believes in God. 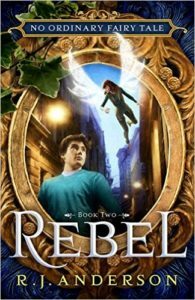 But when a tiny winged girl named Linden bursts into his life and begs him to help save her people, the skeptical Timothy finds himself drawn into a struggle against a potent evil that threatens humans and faeries alike. 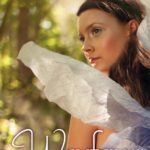 With a deadly pair of hunters on their trail, Timothy and Linden flee across country, drawn by the legend of a white stone that could be the faeries’ salvation. But the dangers that await them test their courage and resolve to the limit, threatening to tear their unlikely partnership apart. And when it comes down to one last desperate battle, they and all the people they love will be doomed unless Linden and Timothy can find the faith to overcome . 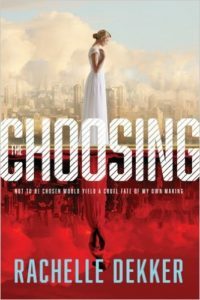 . .
One final note about all these Christy finalists: I’m not surprised that two of the three young adult novels fall into the speculative category. I’m pleased, definitely, but not surprised. Speculative fiction is all around in our culture as TV programs, movies, games, and books. 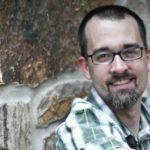 Why shouldn’t Christian novels reflect this same interest? Speculative novels continue to grow in number, and it’s exciting to see them recognized in such a prestigious award as the Christys. Awesome! Definitely got more books to read now….. If you want to know why Christian fiction is failing, here’s a little tidbit why. Out of 28 Christy finalists in that list, 27 are women. Yup, James Rubart is the only male writer in that list. The Christy awards have always been female dominated, but a 4% turnout is embarassingly low even by their standards. If I were a Christian publisher, I’d start seriously worrying about Christian fiction becoming a pink ghetto. Sorry, David, I don’t buy that. That’s like saying, The reason the US Constitution isn’t doing what the founders set out to do is because ALL of them were men. I’m sorry, but gender doesn’t have to come into play unless you want it to. Are books only good if half of them are written by men? That maskes no sense. Either a book is good or it’s not, regardless of who wrote it. I must also disagree. Many of the most popular non-Christian fiction series are also written by women. “Harry Potter,” “Twilight,” and “The Hunger Games” are the most prominent, and are all female-written. Yet they are blockbuster successes. Perhaps it’s worth asking why this is, or why this is at the Christys. But it’s plainly simplistic to suggest that this means these stories are no good, or that some incidental female-favoring “cabal” selected these stories for reasons apart from their quality. Isn’t such a suggestion also very likely insulting to our sisters in Christ? I’m glad Rebecca and Stephen already replied to this because boy, does a comment like that deserve some unpacking. In what other setting* does the heavy predominance of award-nominated female writers even happen, let alone cause such hand-wringing? Anyway, Christian fiction is overwhelmingly dominated by female writers, so it’s no surprise that female authors make up the bulk of the award nominations. It’s also overwhelmingly consumed by female readers, and their money is the same colour as everybody else’s, so I doubt any Christian publishers (who sell plenty of non-fiction books by male authors already) are crying into their coffee cups about that. * The answer to that is romance novels, obviously, but I don’t see anyone crying unfairness over that.